His last tweet, a repost of Associated Press science writer, Seth Borenstein, caring about the environment. His music and ferocious voice lit up my life and it mattered much to me. Yes, in the end it did really matter. I am sitting in my office, still numbed about the news that Linkin Park singer Chester Bennington had committed suicide. I can tell you I don’t like to see names trending on my Twitter feed. Something bad always happen when they do. Law enforcement sources told TMZ that the singer hanged himself at a private residence in Palos Verdes Estates in L.A. County. What a coincidence. Today would have been Soundgarden’s frontman, Chris Cornell’s 53rd birthday. Chester Bennington and Chris were very close friends, and you can tell if you take a few minutes to read the open letter he wrote on May 18. How is everything so heavy? Linkin Park music become part of my music mantra of the past 20 years since I first listened to them. A close friend gave me CD on my birthday back in 2001. He said he didn’t have much to offer me but that the music in that CD named ‘Hybrid Theory’ was good enough and worth what he had paid for. Boy, he’d never been more accurate about anything than that. That year, Linkin Park debut release procured for the band 4.8 million copies sold and the best-selling album of 2001. Songs like “Crawling” and “One Step Closer” became staples among alternative rock radio play lists. “Crawling” helped me to like the music by Linkin Park as it didn’t prominently feature Mike Shinoda’s rap sung lyrics which I yet was not used to. For me, this song is the pinnacle of Chester’s voice. 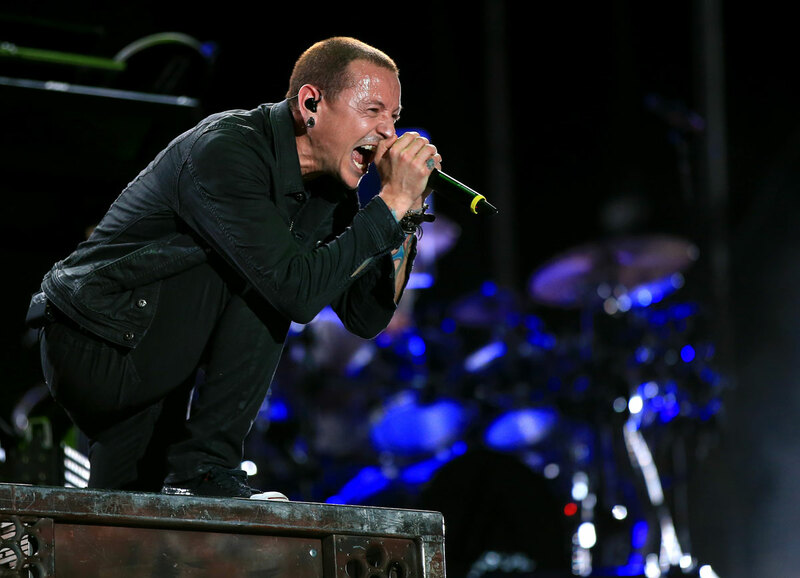 Bennington has said that “Crawling” is the most difficult Linkin Park song to sing live for him, specially because it was inspired by his own battles with substance abuse. Linkin Park has had a string of hits over the years, including “Faint,” “In the End” and like I said, “Crawling.” They even crossed music genres when they collaborated with Jay-Z. The album “Meteora,” that was one of the biggest alternative albums in music history, featured the song “Breaking the Habit”; the fifth and final single from the album. The song is an exception from their previous nu metal/rap rock performances. No distorted guitar riffs and no rapping vocals from Mike Shinoda, who started writing the song before he met Chester Bennington, about another close friend who also suffered from drug addiction. The video of this song, showing a deceased man lying on a car’s roof while all the surrounding is taped off and filled with investigating police officers and onlookers, is very scenic and helps you go through the flashing faces of humanity when we are not in control and how we can rewind our lives. There are moments in life that, like colors that seem to change when seen from different angles, are not easy to cope with. It’s hard to put soulfulness in life in the midst of experiences that affect human existence and the deceptions of modern life. Unfortunately, Bennington couldn’t let it go and “in the burst of light that blinded every angel,” the heavens received a star today. Another ‘gone-too-soon’ idol of my youth. He was one of the biggest talents in the history of music. Society sees artists as expected to bring beauty into a world that is very dark at times. I am happy to say I seek talent, not my self-demand on the quintessence of arts and professionalism. I will forever cherish Chester Bennington’s music and the man whose voice soothed the angst of millions, including mine. So came the shadow of the day, oh Chester! 11:55.